Todays ride, Tuesday July 13, started off normally. I met Bob (Concho) at the Denny's parking lot on Imperial and the 57 Fwy at 8:45 AM and we chatted for a couple minutes then headed on toward a meeting with John (Cuyo) at Temple and the 57 Fwy. Concho did mention that the parking lot at Denny's is messed up and maybe we could find a better place to meet...Good Suggestion. Things go south or in other terms, how did that happen? We pull into the Wendy's parking lot on Temple, and Bob on his ST-1100 finds he has no rear brake and I mean no rear brake at all. He is looking for a possible quick explanation but none is visible. As we ponder that problem, John (Cuyo) rolls in only to tell us he had a slight drop at the intersection near his home. Seems he thought he had the right of way but the other car did too, and while grabbing his front brake, caused gravity to intervene in the mix. Down it went, but virtually no damage with his engine guard and he was able to get it upright without pulling any major muscles. We get Concho on his way home via the 60 Fwy, (front brakes are OK), and head out just the two of us on our giant mountain tour for the day. 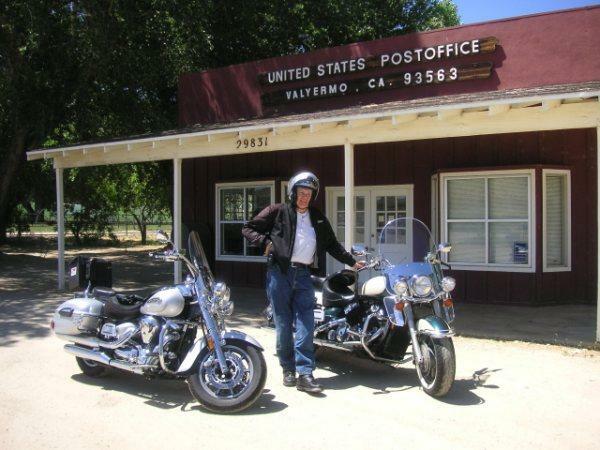 We wind up with over 250 miles of curves and elevations up to over 7,000 foot range along with several roads and destinations I have never been on or seen. Even including a Retreat for monks called St. Andrew's Abbey-more about this stop below. Naturally I did not convert. You can zoom in to see map and trip details. 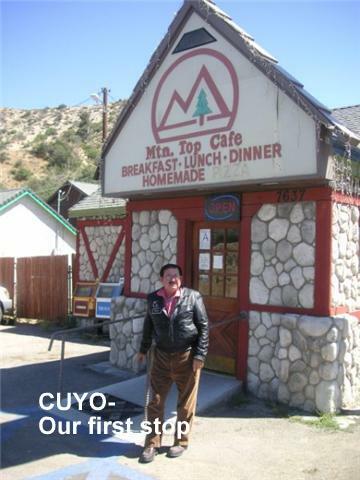 Our first stop is a small cafe on Highway 138 The Mtn Top Cafe, just feet from the turn off to Wrightwood and Hwy 2 heading into the mountains. (FLAG "D") Cuyo (John) likes to take a quick break early for a snack/breakfast. We split a Club Sandwich. 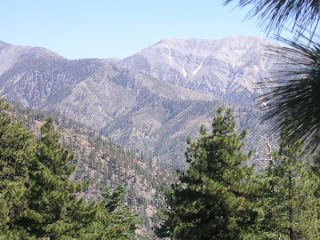 Then it's back on Hwy 2 to Wrightwood, we go the short way and zip past town and on to Big Pines Road heading down to the desert, winding up on Pear Blossom Hwy. Hwy 2 is Open to Mt. Wilson and also to the 14 Freeway via Big Tujunga Rd. We head to the right and down to Little Rock on the Pear Blossom Highway and return on Hwy 2 on the left. As we get near the desert floor we stop at Jackson Lake, not very big but it is water. Cuyo is very sharp at finding photo opportunities, This is on the road as we head to the final drop into the desert towards the town of Valyermo. St. Andrew's Abbey is quite a surprise. Seemingly out of nowhere is this oasis with buildings, fountains, a gift shop, conference center, chapel and green-green grass. and trees. These layers of rocks appear to be worn down by water and uplifted at some point long ago. It's getting warmer but not unbearable. But first it's a gas stop in the town of Little Rock (FLAG 'G') on the Pear Blossom Highway. Average miles per gallon still holding at 40 MPG. After the gas stop it's on to Mt. Emma Road and eventually our possible lunch destination at Newcomb's Ranch-a famous motorcycle stop on Highway 2. BUT FIRST, THERE'S ANOTHER SIDE TRIP! It's the Little Rock Dam and Reservoir. Returning to Mt. Emma Highway we head into Angeles National Forest and get a chance to see some of the damage and devastation from the fires a year ago. The severity of the burn is staggering. In many areas all the trees and anything that was green is just burnt. Sort of looks like the moon scape in spots. We have taken chapter rides through this area when it was all lush and green and the contrast to now is hard to describe. These are from another stop on the road and miles from the 14 Fwy and still all burned. Finally leaving the burned area as we intersect with Hwy 2 heading to Newcomb's Ranch and lunch. Little did we know, but they are open only Thursday thru Sunday. Hwy 39, Azusa Canyon appears to connect with Highway 2 on the map, but it is totally closed and hardly exists, seems to just be a dirt mountain goat trail. These next few are from our last stop on Highway 2 heading back to Wrightwood. This is a tough road for me. I'm able to do between 40 and 45 miles per hour most of the time, but as much as I try to maintain a steady pace, some of these curves just slow me down and I fall behind Cuyo by as much as a half a mile and mostly about 1/4 of a mile, he does slow down at times so we stay together. Wish I could do better, but then again I made it through and was able to catch up within a couple minutes or so. As John R. from STAR says I need to lean more, I'm trying to. I have looked everywhere on the motorcycle and can't seem to locate the lean, I know it's on there somewhere, will continue looking. We roll back into Wrightwood and head to the Grizzly Cafe on the main highway. John (CUYO) is appalled that I come all this way and order a basic hamburger. I could have stayed in Placentia and ordered a hamburger. I have no class what-so-ever, I admit it. Lunch over and it's about 80 degrees outside and near 4:30 pm. Time to get back to the real world, but first let's stop and take a few pictures of the rock Formation at Highway 138 and the 15 Freeway. You can't miss them as you head up the Cajon Pass to Victorville. We tried to stop on the highway but had to move or get run over. These were taken at the intersection of 138 and Lone Pine Road. Way in the background is the 15 Freeway on the Cajon Pass. That's it for this trip. We did make it to 255 miles and lots of side trips for photo opportunities, Thanks to Cuyo for leading the ride and knowing a lot of side trips that made it much more than a motorcycle ride. Great weather, it was hot out in the desert but manageable, and reasonable (mid to upper 80's) in the mountains. Traffic was very light on the mountain roads and even heading into Orange county managed 80 miles per hour for much of the 57 Fwy. Quick trip to Mt. Baldy.